Set up a 2-layer bamboo steamer in a skillet and add enough water to reach the bottom rim; bring the water to a simmer. Or set up a 2-layer electric steamer according to the manufacturer’s instructions. Put the potatoes in the bottom tray of the steamer and cook until just tender, about 15 minutes. Meanwhile, put the basil, hazelnuts, garlic and 2 tablespoons olive oil in a blender. Finely grate in the zest from half the lemon and squeeze in all of the juice. Add 3 to 4 tablespoons water and puree. Season with salt and pepper. Transfer to a bowl and stir in the yogurt. After the potatoes have cooked 15 minutes, place the salmon in the top tray of the steamer. Season with salt and pepper and cook until the salmon is opaque, 6 to 8 minutes. Let the fish sit in the steamer off the heat while you transfer the potatoes to a bowl and smash with the remaining 2 tablespoons olive oil and the pecorino; season with salt and pepper. 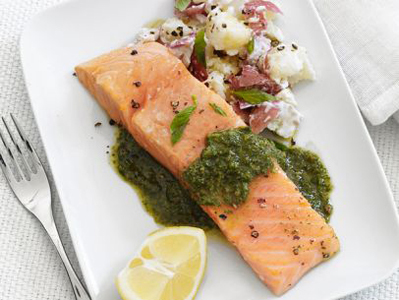 Remove the salmon and top with the pesto and more basil. Serve with the potatoes and lemon wedges.